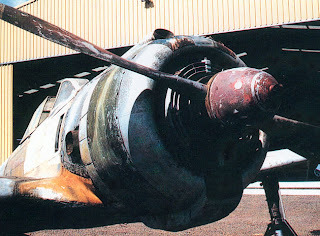 Some interesting colour photos of Hayabusa # 750 during restoration were posted on j-aircraft.com with an observation that the only remaining paint that could be seen on the airframe was "dirty brown" and the "dark grey" of the anti-glare. This type of observation might give rise to a misperception about the original colours of this aircraft, especially in the absence of other, perhaps less accessible, information. 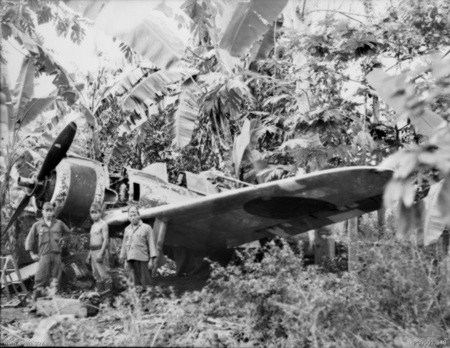 Hayabusa #750 was an 11th Sentai machine found hidden four miles from Vunakanau Airfield, Rabaul by Sqn Ldr Denys Hamilton and RAAF party in September 1945. The aircraft was in the hands of a JAAF repair unit, the 14th Army Repair Depot. It was subsequently crated and sent to Australia in December 1945. 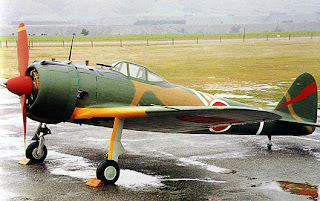 The Hayabusa remained in the possesion of the Australian War Memorial Museum until 1953 when it was sold to R G Curtis. From 1962 until 1980 it was owned by Sid Marshall. In 1985 it was sold to Col Pay at Bankstown Airport NSW. Eventually in 1993 it was purchased by the Alpine Fighter Collection in NZ and completely restored by Jan Bullock and Doug James to its original colour scheme and markings. This veteran survivor is now in the possession of the Flying Heritage Collection at Paine Field, Washington, USA. 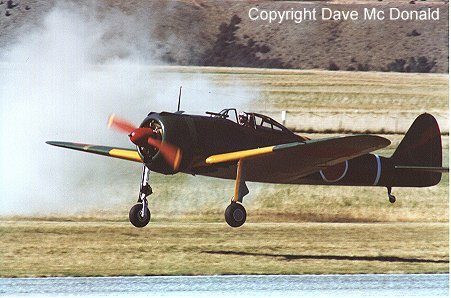 At the "Warbirds Over Wanaka" airshow on 29th March 1996, pilot Simon Spencer-Bower took Hayabusa # 750 on a high-speed taxi run and to the amazement of the watching crowd lifted her briefly into the air. 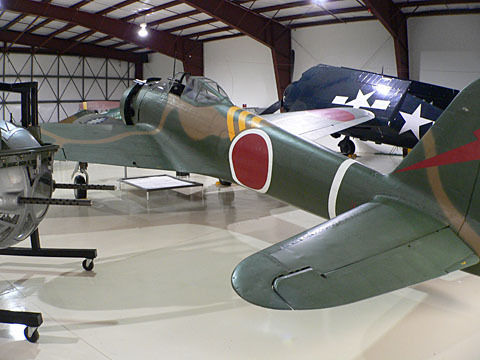 This was the first time that a Hayabusa had flown since the end of hostilities in 1945 and remains the only time that an original Ki-43 has flown. "Before restoration commenced, original JAAF markings were clearly visible, along with what appeared to be a lightning flash on the tail. Research into this revealed that this was the insignia of the 11th Sentai. Also visible were three chevrons behind the rear canopy. Our research was inconclusive as to the meaning of these and they were to be a riddle for a few months yet. "Unfortunately, because the aircraft had been paint stripped in Australia many years before no paint flakes were visible on the chevron outlines. Other parts still had original paint flakes remaining however, and prior to restoration paint samples were collected from each area to ensure as much original evidence was recorded and saved as possible. This paint research and colour matching continued throughout the restoration programme. We made a decision to paint the aircraft in lacquer to enable an adequate flattening agent to be used and to keep the appearance in the era in which the Oscar was constructed. It is important not to overglaze the paint and ruin the historic appearance of the aircraft. "A widely held theory that this aircraft was actually two different aircraft which had been put together some time since the war, probably evolved because in the main, the forward fuselage and wing sections had not been paint stripped. Through identification of serial numbers we were able to disprove this notion, but it is easy to understand how such theories come about. "We also thought the rear exit door was from another aircraft, as it was painted cream and visually did not tie in with the rear fuselage bare metal. However once we had stripped the rear exit door, which fortunately for us had escaped the early paint removal in Australia, we found the remains of the Hinomaru quarter, with white band and green paint flecks of what was to be the main colour of Hayabusa 750. Research indicates that aircraft with a white band encircling the Hinomaru on the fuselage normally had a dark colour scheme. The Oscar now fitted this evidence, tying up the rear exit door with small amounts of green found elsewhere on the body. "Another major find confirming the main colour (green) of the aircraft was discovered. The butterfly flaps (combat flaps) had at some stage in Australia been covered with modern Ceconite. 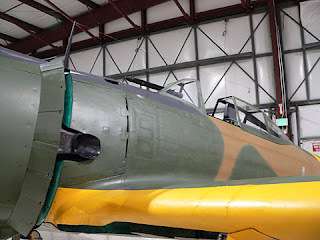 Removal of this Ceconite to enable rework exposed the original fabric still intact in the main and in the same green as flakes removed from the rear exit door and fuselage. Because this fabric had been protected over the years with the Ceconite, a cutting agent was rubbed on the original paint to remove oxidisation providing a larger sample to ensure that the colour match was more accurate, Because the original fabric had been torn, which is probably why someone had recovered them in Ceconite, the flaps themselves required some rework. The original fabric was carefully removed before rework and refabricking was undertaken in the same fine linen material as we had used for the rudder. The restoration team were also able to make contact with one of the original maintenance crew of the 14th Army Repair Depot who had been photographed with this very aircraft when it was captured.
" . 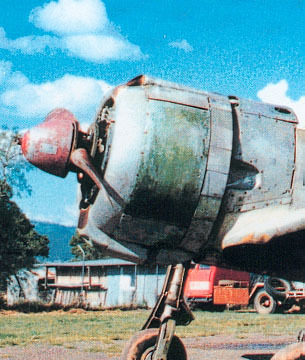 . . although not part of the 11th Sentai, but serving with the 14th Army Repair Depot in Rabaul, (he) did recall that the colour scheme of 750 was as we had deduced, but he told us that it also wore camouflage brown. He was not able to remember what colours the chevrons or lightning flash originally were, so we relied on our samples for the flash, and used white for the chevrons, believing that further information would eventually surface regarding this as indeed it did.
" . 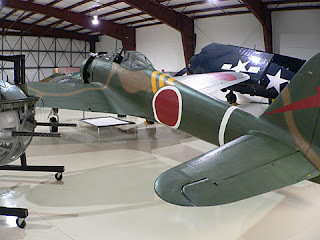 . . veteran Japanese Army Air Force personnel and other interested parties solved the riddle for us. One of the veterans had actually served with the 11th Sentai although based elsewhere. He told us that the chevrons meant that our Oscar flew in the third flying position (three chevrons - 3rd - yellow), of the 11th Sentai’s 2nd squadron (red lightning flash). The chevrons were repainted yellow the next day." Although note that no distinction in this finding was drawn between Shotai and Chutai formations. The well known restoration colours are probably as good as they might be and certainly not deserving of any presumption of inadequacy occasioned by ignorance as to what was actually done. Of course it is always possible to question the veracity or memory of the maintenance man, to challenge the integrity of the paint analysis or colour matching - but by what criteria and to what purpose? Maybe, maybe, maybe? Is the subjective interpretation of a greyscale photographic image really to be preferred to such documentation? Scepticism in research may be healthy but a tendency to throw the baby out with the bathwater is probably best avoided. In pursuing this subject further the original restoration team were requested for additional information regarding the paint colours, but unfortunately, although the analysis and matching had been carefully done, the actual colour values were not recorded. More on early Hayabusa colours to follow. A fine selection of walkaround and close-up detail images of # 750 are to be found in Aero Detail 29 which is recommended for Hayabusa enthusiasts as one of the best and most accessible English language references to the type. Stop Press! New Airfix Zero due! 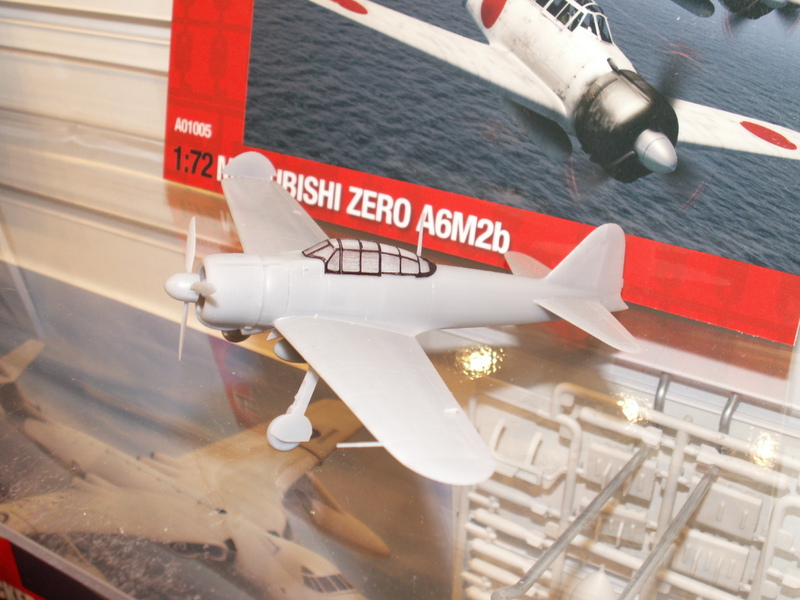 An image of the prototype model of the planned new Airfix 1/72nd scale Mitsubishi A6M2 Zero has been shown around the web, taken at the Nuremburg Toy Fair by Thomas Voigt. If the kit turns out to be as good as it looks this is to be welcomed as the Hasegawa Zero kits can be tricky to obtain and expensive, as is the superlative Fine Molds kit, whilst all the others are long in the tooth now. This should be a relatively inexpensive canvas on which to try out all those Zero colours, although no doubt its appearance will set the whole "debate" going again. I just love your colour articles. Another great write up on one of my all time favorites Nick. I may have to pick up an Airfix Zero just to see what it's like. Just what I need, that little fellow! I was thinking about how to get an ealy Zero dione for reasonalble money and airfix comes around the corner. great, I will definitely pick it up. I can't get a closeup the Airfix to show on the computer, but looking at the small picture it looks like there are 4 propeller blades? I know that can't be right. Please post an in-box review of the new Airfix Zero kit, when you get one.